It's been raining all day here. Raining? That's stupid. It's Christmas time. It's Michigan. If ever it was supposed to snow, now is the time. Hello? There aren't any holiday movies with rain. That's stupid. I mean I haven't been the most jolly person this year. I need a good old white Christmas moment to help me believe. Never fear my friends, I am not all doom and gloom. I am slowly getting with the spirit of the season. Getting into our traditions and starting new ones. And after having Strep last weekend and sleeping for three days, I feel so much better and I am really into our traditions and the holidays. Even if it is raining. We have an Advent calendar and every night after dinner the kids pull out a little slip of paper with a special treat on it. For example, one day it was "extra 15 minutes of Wii" and another day it was "Christmas movie and popcorn." It is never a present and I try to stay away from too many sweets as treats. It is usually the gift of time...extra time to play, one-on-one time, family time. Last night's treat was "Family Game Night." A fun game of Disney Scene It. Some players were losing their cool. Ultimately, there was a winner. And he wasn't very gracious. 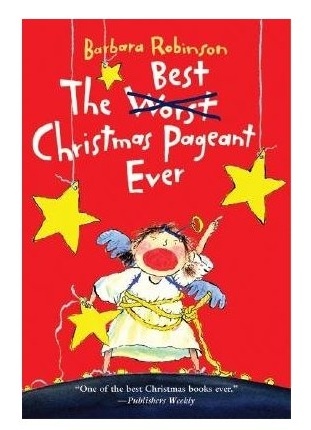 Another tradition I love is reading "The Best Christmas Pageant Ever" which we started last night. It is a wonderful book for kids that parents can enjoy too. It is funny, spiritual and very charming. I sound like I am selling it, sorry. It's a book about a group of crazy-haired, unkept, wild children who wreak havoc on a Christmas pageant. My parents read it to my siblings and me when we were little. Never did I imagine my family would now resemble the unruly bunch in the book. Click here to read a little about why my Lucy isn't allowed to play the role of an angel ever again at church. We read a chapter every other night or so. It was a good night. Even if one of the kids was carrying a grudge from losing Disney Scene It to his dad and went to bed early without hearing the first chapter. It was good, not perfect. And that is just fine with me. Rain or snow, it's the holiday season and it feels good. What's up with Karen wearing shorts? Or does she even have shorts on? What is going on with Karen???? Love that movie! Great blog! !